Forget about signing petitions. Forget about 'awareness raising' wrist bands. Forget about Live 8. The solution to world poverty isn't going to come from top-down government aid. It's going to come from bottom-up micro-credit. Aquilina lives in Peru. When her husband died, she was left alone to bring up her young children on her own. She supports her children and grandchildren by taking in laundry. She wants a loan of $350 to pay for a washing machine, in order to reduce the physical effort and to open up a small laundrette. 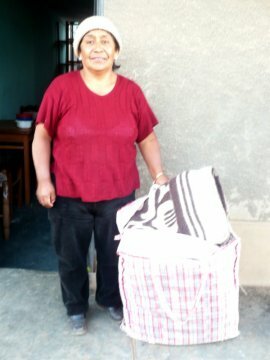 Aquilina will get her washing machine, I'm happy to say, thanks to micro-credit arranged by KIVA.ORG. There are many more people, in similarly poor circumstances, in need of your help. So, let me make you an offer. I will send the first ten people who sign up to Kiva.org, and lend at least $25 via it, a $50 Kiva gift certificate. All you need to do is submit a comment to this post, with the URL of your Kiva lender page and the email address to which you want the gift certificate sent.